Open rhinoplasty is one of the key surgical techniques used to perform cosmetic surgery of the nose. A comprehensive consultation will precede the actual procedure, which can create a solid foundation for a successful surgery. The surgeon will determine the patient’s candidacy for open rhinoplasty during the consultation and will educate them about various aspects of this surgical technique and how it differs from the closed technique. Dr. Eric Yavrouian is a facial plastic and reconstructive surgeon providing open rhinoplasty and other invasive and non-invasive cosmetic procedures. During the initial consultation, the kind and golden Dr. Yavrouian will address the patient’s concerns and help them make an informed choice. Dr. Yavrouian provides open rhinoplasty to patients in Glendale, Pasadena, Burbank, Greater Los Angeles, Beverly Hills, CA, and other communities and towns in this region of the country. At the onset of the consultation process, the surgeon will seek to know why the patient wants to undergo open rhinoplasty, and which aesthetic or functional aspects of the nose may be bothering them. The surgeon will also seek information about the patient’s current health condition and past medical records. Patient’s cooperation in sharing these details is essential to developing an individualized open rhinoplasty cosmetic surgery plan. An experienced surgeon will like to take into account the patient’s personal aesthetic goals and aspirations with regard to their nose and face. They can incorporate this feedback into the customized open nose surgery plan to meet the patient’s goals in a less invasive, more targeted manner. The surgeon will evaluate the overall facial anatomy and balance between the chin and nose and other facial features to create an effective nose surgery plan. The surgeon will review the previous medical records of the patient and check whether the patient is suffering from any specific health condition such as heart disease, neurological problems or an autoimmune disorder, or has any known allergies. The surgeon will also examine the quality and thickness of skin in the nose area, the availability of bone and cartilage, and other nasal characteristics. Patient’s incision preferences will be discussed because open rhinoplasty will involve one small external incision and may leave a minor scar. Photographs or x-rays of the nose may be taken for the records. The patient will be required to disclose if they have a habit of smoking, so that the surgeon can guide them about refraining from the habit for at least a certain time period. During the consultation, the patient should also carry a list of all the prescription and non-prescription drugs, herbal supplements and vitamins that they may be currently taking. The patient will have an opportunity to ask questions during the consultation, and clarify all their doubts and concerns before making a final decision. A dedicated surgeon will address all questions in adequate detail and to the complete satisfaction of the patient. 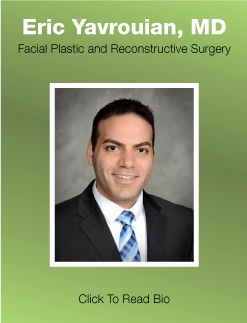 Awesome and perceptive facial plastic and reconstructive surgeon Dr. Yavrouian receives patients from Glendale, Pasadena, Burbank, Greater Los Angeles, Beverly Hills, CA, and other towns and neighborhoods in this part of California for open rhinoplasty.